For the third consecutive year we’re proud to have developed this visual interpretation of what we felt were 17 of the most compelling video marketing statistics to help you get your video budget increased in 2017. Have a skeptical boss you need to see the light of video marketing? 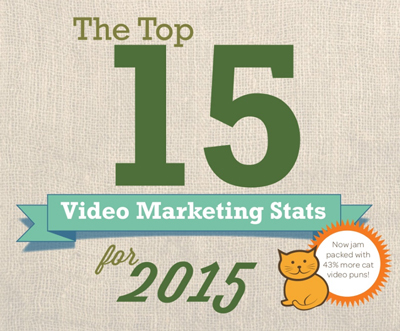 Do amazing video marketing statistics make you get all giddy inside? Do you enjoy silly puns about cats in videos? Then behold! There’s also a few kittens dropped in with stats and puns because let’s face it, if it wasn’t for cat videos…our feline overlords would likely pull the plug on the entire internet. Enjoy! 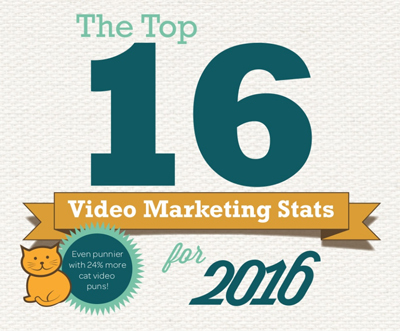 Want your own copy of these purr-ific video marketing stats? Simply enter your info to download a PDF of the 17 Video Marketing Stats for 2017. The Top 17 Video Marketing Statistics for 2017: Now with 17% more cat video puns! 83% of moms search for answers to their parenting questions online & of those, 3 out of 5 moms turn to online video first for their answers. – Google 3 out of 5? You cat to be kitten me? This year, video content will represent 74% of all internet traffic. – Cisco That’s a LOT of cat videos! Zappos sells up to 30% more when using product videos. – Business Insider Wow! That’s meow-nificent! 81% of brands feature video on their website. – Insidecxm Homepage videos increase conversions by 20% or more. Where both text and video are available on the same web page, 69% of users would prefer to watch video to learn about a product or service. – Wyzowl Why shouldn’t this be mew?